New handheld battery operated LED tester checks out-of-circuit Light Emitting Diodes. Receptacle tester for typical 3-wire receptacle. For use on 110-125 V.A.C. 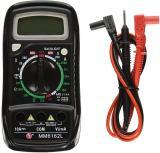 A must have item for any Pinball Technician's toolbox, handheld Battery tester for quick power check.